On June 27, 2006, we flipped the switch on TED Talks, bringing talks from TED to the world for the first time. It was early days for online video — YouTube was just a year old; the video iPod had been around for six months — so we launched with six talks and modest goals, and have been amazed by what’s happened since. Five years and nearly 1,000 videos later, TED Talks have been watched 500 million times, and translated into 81 languages by volunteers worldwide. In fact, we’ve seen a number of key milestones in the last month: We welcomed our millionth fan on Facebook and our millionth iPad app download, and marked the 2000th TEDx event. We’re filled with gratitude for the global community that has made all of this possible: the TEDx organizers, the translators, the corporate partners who support our work, the speakers who offered the world their words, and the wider TED community, who amplify the talks, and continually energize us with their own ideas. And thanks to the growing global reach of TEDx, and our army of translators, we can expect to see great talks in many different languages in the future. As we approach the next five years, we’re thrilled by the prospect of sharing the best speakers in any language. And we’d love to hear from you! Jump in to our Twitter feed or Facebook fan page and answer the question: Why do you watch TED Talks? What I enjoy the most about TED is that the presenters are kind of like thought painters reflecting Earth’s beautiful gifts. TED is my primary resource for timely videos to share with my students. I teach Computer Aided Drafting at a Technical High School and I often incorporate a TED Talk into my plans. They help me teach engineering and design but also how math, science, and technology interact with our lives, society, politics, and future. Not all of my students “get it” – yet. TED keeps me thinking about things I didn’t even realise existed. It is now our family dinner time viewing. It starts conversations with our kids that expands our minds and engages us all.We are more broad minded because of it. Thanks TED. Extremely motivating, inspiring . . . which almost forces one to come out of the comfort zone. have been sharing the name, weblink, etc etc . . with anyone who will care to LISTEN. Just TERRIFIC ! Please keep up the momentum and continue to engage and discover the Hidden GEMS of the WORLD. Sincere congrats for your extraordinary work, TED’s success is to everybody’s benefit, worldwide. For the last couple of years, I had been wondering if you were going or not to select and share non-English speaking TEDx talks. I am so glad the frst one has finally been posted and look very much forward to the next ones. 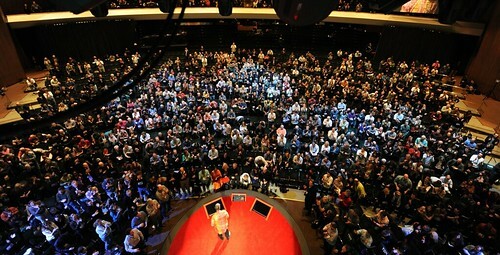 Being a part of the TED family as an attendee and TEDx organiser has made a big difference to many parts of my life. Thank you TED, as you are making a real difference in the world with the important work you do. Congratulations, TED. You’ve made this a better world by promoting promising ideas and helping to implement them. Keep up the marvelous work. What a milestone! I’m so glad the videos are available online for free. Congratulations! For me TED has become my digital home. I believe TED has paved the road for next 5 great years by turning to more community participation and social advocay today. Promoting Emiliano Salinas on its 5th anniversary is a beacon !